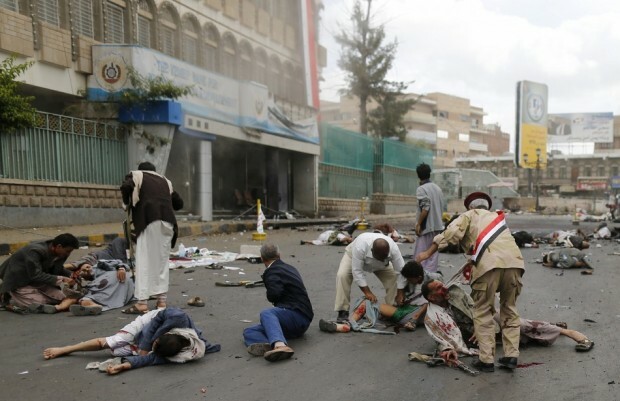 First responders check the wounded and the dead at the site of a suicide attack in Sanaa October 9, 2014. ISIS, even on its own so-called people, uses force and fear to get things done. People would have thought fighters of the Islamist jihad group are afforded certain privileges at least. But Kareem Mufleh, a young 15-year old ISIS fighter captured by a Kurdish group early this year, presented an uglier picture. Mufleh, whose face was covered throughout the interview with CBS News, readily admitted that he was indeed one of the ISIS’ fighters. But he likewise easily defended his entry into the blood-hungry band was a choice between life and death; he chose the former.